The "component "" failed because error code 0x80131537 occurred, and the error row disposition on "output column "" at "output "" specifies failure on error. An error occurred on the specified object of the specified component. The "component "XML Source" failed because error code 0x80131537 occurred, and the error row disposition on "output column "" at "output "" specifies failure on error. An error occurred on the specified object of the specified component. Cause: It is due to data type mismatching. In other word we can say that we are trying to stores string data into int column, long data in int column etc. In case of XML Source we have to correct its .xsd file. [XML Source ] Error: The "component "XML Source" (210)" failed because error code 0x80131537 occurred, and the error row disposition on "output column "state" (1362)" at "output "address" (796)" specifies failure on error. An error occurred on the specified object of the specified component. Here column state is type of string. Here type of column state is int. Click on Yes button then OK button. Step 5: In all effected components right click on it and choose edit option. 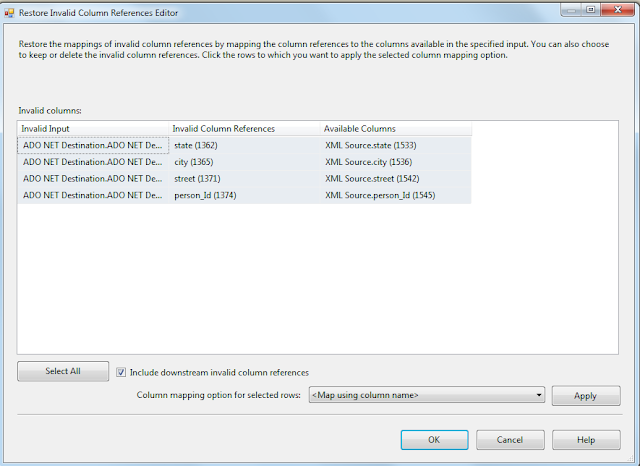 Select all invalid inputs and from Column mapping option select row combo box choose Map using column name and click on Apply button and then OK button.